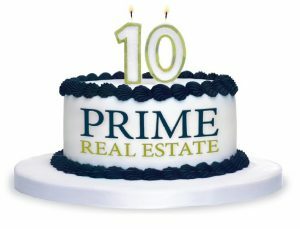 On behalf of the entire team at Prime Real Estate, we would like to thank our clients past and present, for entrusting us with their selling and leasing needs in the last 10 years. We truly appreciate your business, and are grateful for the trust you have placed in us. We will endeavour to continue to give you the kind of Prime service you deserve. We look forward to achieving Prime results for our clients for years to come!